petit main sauvage: Welcome! And on to more. 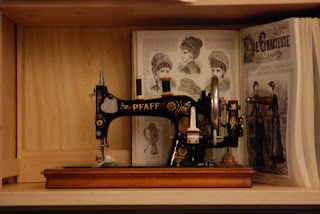 The promise of this excellent piece by that blogger, Elaine (great seamstress, blogger, and, as it turns out, comedian) was one of the very flattering things I mentioned in my last post. The other one being the fact that Carolyn (the lovely lady behind handmade by Carolyn) nominated me for the Kreativ blogger award. Of course, I had no choice but to humbly accept the honour. 1. If there is such a thing as a sewing gene, that might go a long way to dispelling the selfish seamstress's accusations of my using black magic. Two of my great grandmothers were professional seamstresses until motherhood forced them to give up work. Both my grandmothers and my mother used to sew for their children when they were young, although they all claim they never aimed for a professional level of craftsmanship. But hey, such a trait can skip a generation or two, can't it? 2. I have no sense of rythm whatsoever. I'm the girl who will get out of tune by the third clap when clapping along with the music among two thousand other people. 3. Both in highschool and in college, some of the people I hang out with (not the same people, by the way, no one from my old highschool went to art college with me) used to call me 'Miss Walking Encyclopedia'. Oh yes, I'm a know-it-all and often, I can't help showing it. Sometimes I get a little embarrassed about it myself, but it has served me well on many occasions, too. 4. I don't eat eggs. I'm not allergic and so I don't might them as an ingredient you don't taste, as in cake or in meatballs, but I really hate them on their own. When I was about twelve, the sight of my little brother, sitting across from me at the breakfast table, almost literally digging in to his soft boiled egg (the smell of which all seamed to be coming in my direction) would make me want to flee from the room. 5. I never wear jewelry, except a ring with a large stone on each ring finger (I used to wear just one, on my left hand). And I have developed a superstition about them. Whenever there's a big change in my life, I have to change my ring. I can never find a new ring when nothing has changed or will change and the old ring has a tendency to get badly damaged or lost when change is about. I stick to silver rings, set with semi-precious stones (amber, on the one I wear now). L: 200 m? How do I know when I've driven 200? Oh yeah, I know, I know, you'll tell me! L: I don't need you to tell me to go on on the road I'm on, you stupid thing! Just tell me when I need to change direction. And anyway, whose voice did they record for you? Who can't pronounce the letter 'A' normally?? 7. I'm a last generation analog person. When studying photography, I was the last woman standing in the black and white darkroom and I was the last student to produce graduation work on the old-fashioned 4by5 inch film. Maybe it's also why I love sewing. There's no way to make a piece of fabric into a garment by computer.. yet. Although I can use computers (well, I can even keep a blog) I still find it easier to gather information in a library than on the internet, and I'm not present on MSN, facebook, twitter, hyves, myspace, linkedin, flicker, youtube or any other 'social network' or other place for sharing which I haven't even heard of yet. Well, that's it. Because of point nr. 7, I guess it shouldn't surprise anyone that I don't actually follow that many blogs, so I don't think I could come close to nominating 7 people (a lot of other people I was thinking about, have recently received the kreativ blogger award already). 1. Melissa, whose blog is always a joy read. I don't think I would be blogging if I hadn't been reading her blog for quite a while. 3. Elaine, who may blog as the selfish seamstress, but has been responsible for Burdastyle's most popular member-made pattern ever. I arrived via Selfish Seamstress! Am blown away by your creations, especially your leather blouse-jacket! Thankyou for telling us those interesting things about yourself! Hmmm, I wonder what you're saying to your computer as you're reading this right now.....? What interesting information! You claim not to know the social networking sites, but you named a lot that I have never heard of before! I assume you have a digital camera now that you are blogging? Do you do DSLR, or a point and shoot? I just learned of your blog by way of Selfish Seamstress. So glad I found your blog. 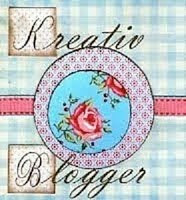 Wow, I am impressed by your creations and know you will be an inspiration to my sewing projects.